This is one of Malaysians’ all time favorite. I made the sambal using some pre-made sambal paste that my aunt had prepared for me back at home, and added brown sugar (palm sugar would be better) and salt to season them just right. For some twang, you can also add tamarind juice. The hard boil eggs were deep-fried after the shells are removed. For the sambal, I did not want to use shallots (they are quite pricey in US/Canada as well), so I sliced some celery and caramelized them in the pan until they soften and turn slightly brown. While the taste of onions were absent, the texture were quite similar to the real thing. The deep-fried hard boiled eggs were added to the sambal mixture after the sambal is done. The sambal paste is quite simple. Pan roast vegetarian belacan powder and curry leaves in a wok until fragrant. Stir in blended chilies. Oil is added to the mixture and then cooked until the oil separates from the mixture. We simply store them in jars after the mixture is cooled. This mixture works really well in Prawn Noodle (Mee Yoke) soup with lots of roasted seaweed or seaweed paste that can be bought from the store. Since we had leftover curry from a few days ago, I made a simple green bean and tofu stiryfry to compliment the meal. For the anchovies (ikan bilis) I experimented with shredded mushroom stems that were coated with bean flour seasoned with salt and mushroom flavouring (corn flour can be used) and then deep-fried as well. The peanuts were pan roasted with some oil. The “fake anchovies” and peanuts were then tossed with a sprinkle of salt. I ran out of pappadums, otherwise, this was pretty close to home! 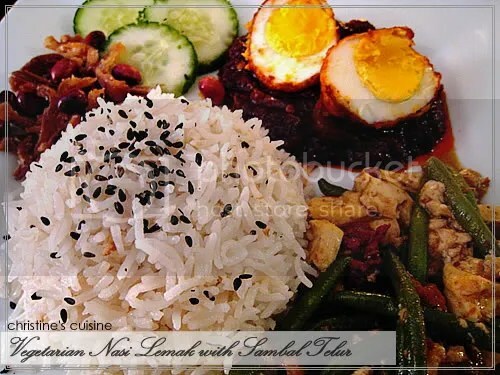 This entry was posted in Malaysian and tagged food, Malaysian, nasi lemak, sambal. Bookmark the permalink. you better come home and cook for me now….i love the sambal telur!!!!!!!!!!! faster catch the next flight back!!! Hey, that thing to too damn good to be true. God I am HUNGRY! Arrgghhhh, got to go to Christine or go home soon! Wow…air liur non stop…..I wanna try to cook but i don’t have sambal paste here. I wish my mom can bring me some next year when she comes over but will the custom let it in? wah-this looks awesome. Wish i was there for dinner. gosh you’re so creative! those fake anchovies look so real… mmm… sambal looks so delicious! how i wished you lived close to me, then i’d be inviting myself over to dinner every night, lol!